A guide to the summer's best group bike rides. 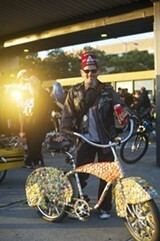 The theme of a recent East Bay Bike Party was Candyland. If you begrudgingly spend your weekend nights waiting in line to get into a club that plays music you hate in hopes of meeting someone, or sitting in your room alone re-watching episodes of Breaking Bad in hopes of understanding all the references that your friends are still making, there is another option: bike parties. Whether you're a politically minded rider looking to change the culture of transportation, or just seeking good music, lights, and dancing to accompany your ride, bike parties have you covered. 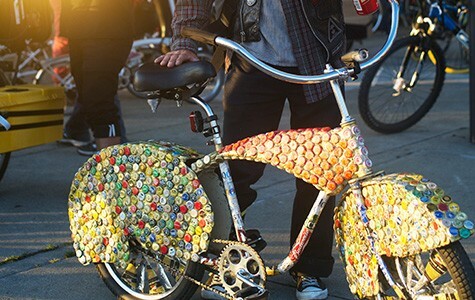 Kick off the summer with the third installment of Hella Big Bike Party, which is organized by the Los Angeles biking group Midnight Ridazz, in conjunction with the San Francisco, Oakland, and San Jose bike parties. This party will feature a food truck and games such as tug-of-war and jousting, according to the event's Facebook page. Volunteers from the East Bay and San Francisco bike parties will be on hand to help foster bicycle safety. The planners have yet to announce the route, but it will be more than twenty miles. Riders are asked to observe bicycle etiquette by, for example, staying in the right lane and not getting overly intoxicated and causing crashes. The ride will likely be similar to the East Bay Bike Party in size, so expect plenty of people in costume and decorated, lit-up bikes. Meet up at 7:30 p.m. at the Richmond BART Station; roll-out time is 8 p.m. to catch the sunset. No leaders, no organizers, no route. The most politically charged ride in the Bay Area is simply a mass congregation of cyclists riding throughout San Francisco, largely to raise awareness of bike culture. While other rides have specific rules, such as prohibitions on going into the left lane of traffic, this ride is a little more relaxed (although riders are encouraged to not yell at motorists). Critical Mass also tends to be more hilly and traffic-y than both the San Francisco and East Bay bike parties because it starts earlier in the day. Without a fixed destination or leader, the ride lasts as long as you'd like. Meet up is at 5:30 p.m. at Justin Herman Plaza (by the Embarcadero BART stop), roll-out is at 6 p.m.